The teams from Riverdale High School and Smyrna High School, both in suburbs of Nashville, were removed from the playoffs, placed on probation for a year, and fined $1,500 by the Tennessee Secondary School Athletic Association. 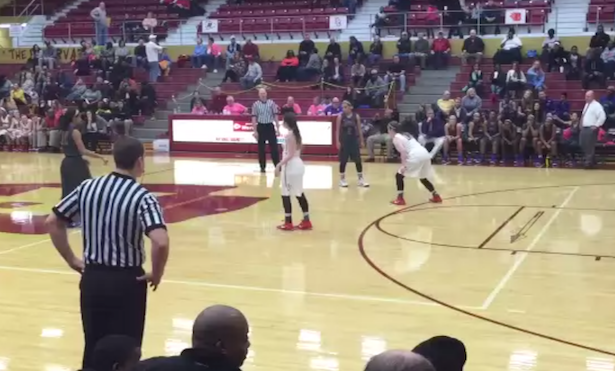 Two Tennessee high school girls basketball teams have been removed from the postseason after they both tried to intentionally lose a game against each other. The teams from Riverdale High School and Smyrna High School, both in suburbs of Nashville, were also placed on probation for a year and fined $1,500 by the Tennessee Secondary School Athletic Association (TSSAA). In letters to both schools, the TSSAA said that the programs were being punished because the teams made a “mockery of the game” by trying to lose on purpose. The TSSAA said they did so because neither wanted to be seeded third in the post-season tournament. According to an account by the game’s referee, Riverdale started out in a 2-3 zone, which was not usual for the team. The Smyrna coach soon realized what was going on, according to the referee, and decided to swap in his second team. Riverdale then did so as well. According to TSSAA executive Bernard Childers, the Riverdale coach told his players they would have a better position in the post-season if they lost. The game then became a game of who can try to lose harder, as is apparent in videos taken of the game. They even tried to shoot into the wrong baskets. Here, one player meanders around the court while everyone stands and watches. Smyrna trying to hand Riverdale the ball back. Intentionally getting called for a backcourt violation. Finally, the referee said he had enough and pulled both coaches aside. Though the players stopped trying to shoot for the wrong baskets, they still continued to play to lose, he wrote. “Now, I think Riverdale was the first to start ‘let’s lose the game,’ but both teams obviously didn’t want to win and it really showed,” the referee wrote. The principal of Riverdale, Tom Nolan, apologized for the incident on Twitter. I would like to apologize to our students, parents and our community for the unsportsmanlike conduct and disrespect for the game. What happened Saturday was wrong! To the people throwing the stones! Who in their professional career has not had a 3 min laps of j ment? Smyrna’s principal, Rick Powell, told the Tennessean that he and Nolan had asked the TSSAA to just punish the coaches, not the players. However, the TSSAA decided to punish the programs because the players had been active participants, the newspaper reported.